There's an old story you may have heard surrounding Easter Sunday morning. It falls into the category of what is called in Italian, "Si non e vero, dovrebbe!" That means, "If it's not true, it ought to be." The story surrounds Mary Magdalene's announcement to the Apostles that our Lord has been Resurrected. It's one of those things that's not recorded in the Gospels but makes for a good story. Mary Magdalene returns from the empty tomb on Easter Sunday morning and says, "I have good news and I have bad news: The good news is, "He is Risen, Alleluia!" The bad news is "Our Lord wants to know where you all went this past Friday." Our Gospel today takes us back to Easter Sunday night. Having heard Mary Magdalene's story of what she encountered at the tomb, the Lord doesn't allow the Apostles to remain in fear and confusion for too long. He comes into their midst that same evening. Just as Jesus passed right through the linens that covered his body in the tomb, he passes through the locked doors of the upper room and what does He say? He says, "Peace be with you." We ought not to underestimate how important it was for the Apostles to hear those words, "Peace be with you." Think of the context! Just three nights before, the Apostles had abandoned Jesus even though they claimed they would never do such a thing. Judas turned traitor, Peter our first Pope denied our Lord and all the rest, save St. John, ran. And yet, Jesus simply offers "peace." The apostles were not just afraid of being found by the Jews - perhaps they were also afraid that Jesus was not going to be entirely too thrilled at their weak faith. And yet, Christ transcends all bitterness or anger. He recreates an environment of trust and reassurance and intimacy with the Apostles - a sense of deep and abiding peace in the midst of the troubled and guilt-ridden hearts that they must have had so soon after abandoning the Lord. We must ask if we are that heroic in our virtue when others wrong us, even to the point of abandoning us. In this moment of offering peace, Christ is so rich in mercy. After he extends peace to the Apostles, their fear turns into rejoicing because our Lord's offering of peace reconciles the Apostles to Him. It is the same peace that we receive in the tribunal of mercy - the Sacrament of Penance. It is no coincidence, then, that we celebrate Divine Mercy Sunday on this 2nd Sunday of Easter. This observance was established by the Pope some years ago to draw us closer to the infinite love of the Sacred Heart that burns with love for us in mercy. The Holy Father has us turn our attention to our need for the Sacrament of Penance and commends us to pray the Divine Mercy chaplet daily, which can be prayed on ordinary rosary beads. If you are not familiar with this devotion, I invite you to learn more about it. Thanks to the Internet, there are dozens of websites devoted to the Divine Mercy Chaplet. Learn to pray it as an individual as a couple or a family. In our consideration of our Lord's divine mercy and just a week removed from Good Friday, we don't venture too far away from the Cross and continue to recognize our weakness and failings and sin and turn again to the Lord with the full hope of the Resurrection - the fuller reality of the spiritual Resurrection that occurs in the confessional. Immediately after Mass today, I will expose the Blessed Sacrament for a brief period of Exposition, followed by our praying of the Divine Mercy Chaplet and then followed by Benediction. I ask you to join me in this wonderful devotion. On Easter Sunday night, our Lord establishes the Sacrament of Penance. Our Gospel describes how Jesus "breathed" on the 11 when he said, "Peace be with you." In doing so, our Lord subsequently established the Sacrament of Penance by assuring the apostles that whose sins they forgive are forgiven and whose sins are retained by them are retained in heaven. The only other time in the entire Scriptures that the same Greek word for "breath" is used is when the Father forms Eve out of the side of Adam in Genesis. Thus, the Church is Christ's new creation and she now breaths with the life of the Holy Spirit. Our Lord transfers his mission of mercy - his mission of healing and reconciliation to the Father onto the Apostles, a mission that has continued on to this very day in the Sacrament of Penance. When we hear these words, we are reminded of one of the precepts of the Church - to make a sacramental confession at least once a year, usually during Lent or in the Easter season. Today's Gospel also includes the famous episode of the disbelief of St. Thomas the Apostle. The Italian painter, Caravaggio, depicts this scene so well in his work entitled, Doubting Thomas. In the painting, St. Thomas leans over at our Lord and peering into His pierced side, slowly and cautiously places his hand into the side of our Lord in total awe of what he is doing. The other Apostles gathered around Thomas and our Lord look on, incredulous at what they are witnessing. Our Lord's gaze grasps at Thomas' hand and leads it into his pierced side, as if to invite Thomas to stop persisting in his unbelief. Today's Gospel and and this portrait tell us that our Lord's wounds of crucifixion were significant. After all, Doubting Thomas places his finger into the nail marks and his hand - his HAND - into the side of Christ. This episode shocks the Apostles for two reasons: first, they're still getting over the fact that our Lord is alive. Considering how brutal his death was, the fact that He is alive is awe-inspiring. The second reason that they're shocked is because in his glorified state, our Lord reveals to the Apostles a totally new mode of existence - the Resurrected state. At first the Apostles think that they are seeing a ghost, which suggest that our Lord is appearing to them in a vision, but has no real body. 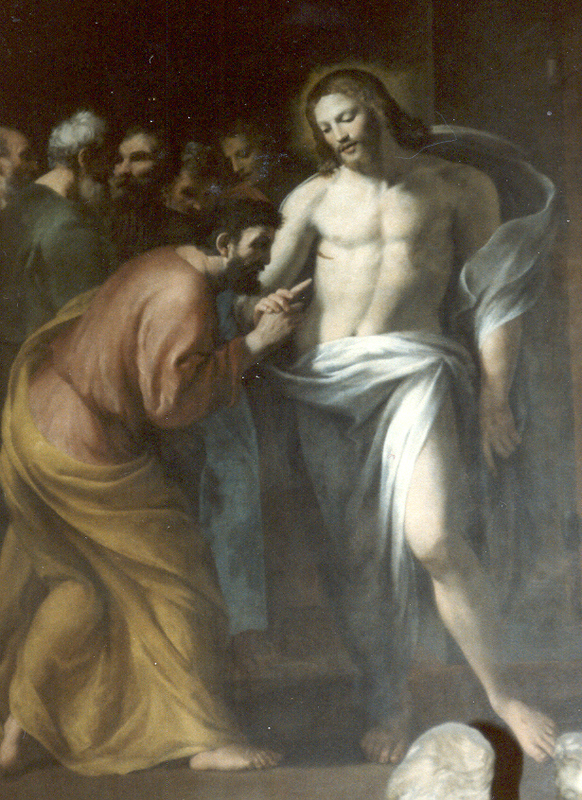 However, by placing his hand in our Lord's side and his fingers in the hands once pierced by nails, our Lord shows that not only is the Resurrected body not bound by time and space since our Lord walks through locked doors, but that the Resurrected body is a real body, not a ghost - a real body in real time with real physical attributes. It mans that our bodies will be a significant part of our existence at the Resurrection of the Body, when our immortal souls and glorified bodies will be rejoined to face Final Judgment. For ourselves, our Lord's words give us much solace. He says, "Blessed are those who have NOT SEEN and HAVE BELIEVED." Thomas and the Apostles were not only given the gift of faith - they were also given the gift of a proof. For us, St. John leaves us with a signature at the end of the Gospel - He tells us that what has been recorded has been for the benefit of our faith but there is so much more that happened that is not recorded - it's the period of time between the Resurrection and the Ascension of our Lord - 40 days after Easter - a time known as the Apostolic classroom - a primitive seminary, if you will. What has been recorded has been left for us so that we may believe that our Lord is the Son of God. What has been recorded has been left for us because it's all true. You know the old cliché, "Some things are too good to be true." This is the only case, where EVERYTHING we believe is really the truth. If you want to see witnesses to this fact, ponder the life of the martyrs or attend a priesthood ordination and watch a man lay prostrate on the marble floor of the cathedral and bet his very life on it. As we rejoice in the glory of the Resurrection, let us pray for a deeper faith in all that we have heard and seen - that we believe that it's all really true and that we will experience the Resurrection in our own lives so long as we remain faithful to the Lord and all that His Bride, the Church, teaches to the very end.